Everything you need to make a pair of attractive mosaic votive candle holders is included in this kit. 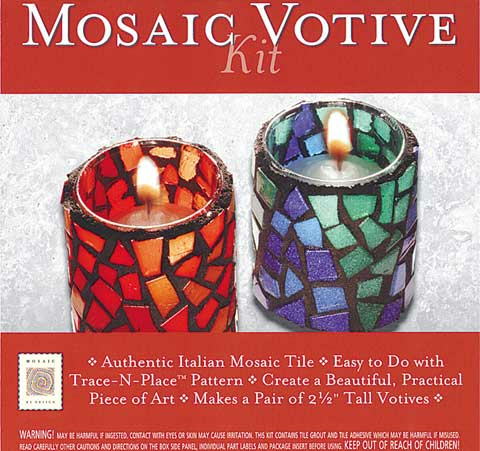 It contains a supply of colored glass mosaic tile, two 2" tall clear glass candle holders, two tea candles, a trace and place color pattern, a 2 oz. tube of mosaic tile adhesive, an 8 oz. bag of black sanded tile grout, a grout spreader tool, one mixing cup, one grout sponge, wooden applicator sticks, a tile breaker bag, latex gloves and step-by-step instructions.